Sam - When you hear the word lasers, what do you think? Sci-Fi battles in a space opera? Perhaps James Bond about to be cut in half? Well, while people have looked into these uses, really lasers are much more commonly used for helping us make things rather than destroy things. This month Samsung have announced their foldable phones and the flexible electronics inside require powerful and precise lasers to cut and drill. So, I, Sam Brown took my phone with me to the Centre for Industrial Photonics at Cambridge University to find someone who could tell me which bits are already made using lasers. Francisco - Hi, my name is Dr. Francisco Orosco. I work here mainly using industrial processes that use laser as the main source. Sam - So you look like you’re busy here, what's happening? Francisco - So today we’re going to be doing a little bit of marking for you, we’re going to be putting the logo of The Naked Scientists into a little piece of steel for you. So what we're going to be looking at is a laser system that uses very fast moving mirrors to reduce the area of the laser to a very small spot -talking around half the size of the width of the human hair. 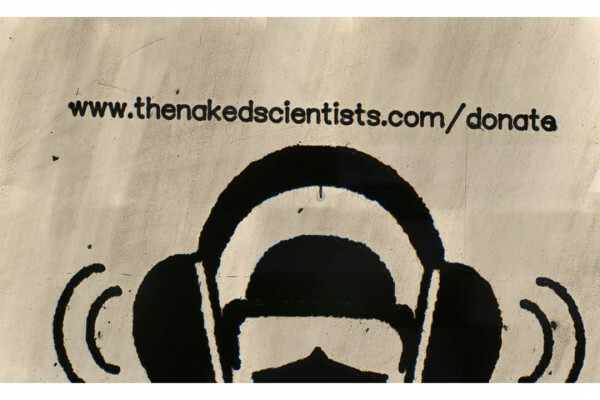 And then from there, the material we’re going to put underneath, which is stainless steel today, that will absorb the laser energy and then it will heat up and we'll be able to remove some material and then you'll see the Naked Scientist logo onto that piece of steel. Sam - Fantastic. It's behind quite a sturdy looking safety screen, why is this here? Francisco - We have a fully enclosed system and the only way to look at the laser is through that little window. So that window reduces the intensity the laser has so you're able to see it, otherwise our eyes or our skin could get damaged from the laser. Sam - Now that I felt sufficiently safe we fired up the laser. Francisco - All right let's kick this process off. Sam - As the marking began we could see the steel glowing brightly as it was heated. Dr Orosco told me the maximum laser power being used was one kilowatt. That's a million times that of a laser pointer you might have in a classroom or use to play with your cat. But how exactly does a laser work? Francisco - Alright so the process that we’re looking at here: the laser is focused onto a very small spot, and it will heat up the material, and it will remove some of the material by heat and then the rest of it you are basically going to have a change in the colour. And that's what we're going to see today. So it will remove a very thin layer and then also heat up the metal, and that's why we have that marking and that's why it's permanent. You aren’t going to remove it with your finger or if you scratch it because it's very durable and it's hard to remove from the material. Sam - So where do I see this on my phone? Francisco - One of the applications that these sort of laser markers are used, is for the marking of buttons or the logo of the company that sold you your phone. All those letters are basically made with the laser marker that's been removing a little bit of the material to give a bit of contrast. Sam - And what else is this used for beside from phones? Francisco - Well in industry, that will be used also for the dashboards on your car, all the digits that are there. Your keyboards as well. Laser markers are used for the clothing industry as well so they're able to make the garments look like they're older, or really make complex patterns with clothing, and they use a marker as well to remove the material and give you that finish that people like. Sam - While the marker was running, Franscisco led me to a room next door with an enormous table filled with shiny, polished mirrors and impressive looking lenses. Francisco - Okay Sam welcome to our ultrafast laser facilities. We basically remove material using a very short pulse laser in this room. Just to give you an idea of time, that will be around a million millionth of a second, give or take. So very short pulses and what this does to the material, it does not create heat compared to the other laser that you've just seen today. So with the other laser we usually create heat and we have heat zones around where the high intensity laser head, the metal in this case, that we were looking at. And in this lab - this laser - the pulses are so short that heat doesn't dissipate to the material. So that is one of the main advantages of this process. Sam - With the heat unable to spread, the material that is left won't be damaged or melted. It was for work on the generation of lasers of this kind that Donna Strickland and Gérard Mourou were awarded the 2018 Nobel Prize in Physics. These lasers are capable of making cuts that are less than a micron wide - that's smaller than a thousandth of a millimeter. But what does ultrafast machining have to do with making parts for my phone? Sam - So what makes lasers so good at doing these things? Francisco - Well you have very tight tolerances, that means very high accuracy, when you're cutting parts. Think of the spot of the laser being, again, a tenth of your hair or smaller depending on which laser you use. So they're able to make very, very fine cuts; as well as there's no vibration. When you're cutting glass, that are very sensitive to that kind of things, you can really reduce the impact of machining and remove material basically from all these materials. Sam - So what else do we use laser micro machining for? Francisco - Well you have a lot of applications for these kind of lasers. So we can add material or remove materials, it depends on what you want. For the health industry, there’s little stents that are made via laser. To machine the solar panels that you see in houses. If you go to the cutting edge of this technology, we have it being introduced for plastic electronics. So next generation devices that we’re going to be having in the next years, this is one of the main processes and technologies that are going to be implemented. Sam - So there's a host of uses, from medical implants to solar panels, for just this type of laser, not to mention those used in other manufacturing applications like welding. Just before I left Francisco had this fairly bold claim to add. Francisco - I’m pretty sure that anywhere where you are you can see something that's been done with a laser.